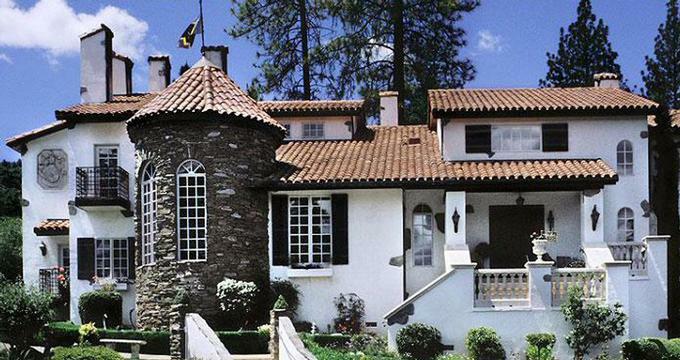 Château du Sureau is a romantic, fairy tale inn located in Oakhurst, California, 16 miles from the southern entrance of Yosemite National Park. This magnificently decorated guesthouse is set on nine acres of meticulously landscaped parkland and is nestled into an oak and pine forest in the Sierra Nevada Mountains. The name Château du Sureau translates into Elderberry Castle, and the inn is so named for the elderberry bushes that dot the property. This fine estate is a wonderful retreat for honeymooners, hikers, families, and lovers of fine cuisine. 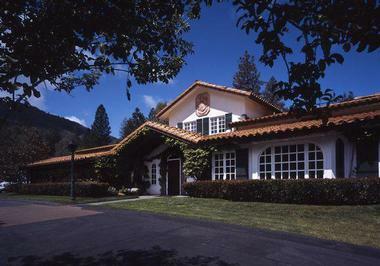 The ten-room California inn built with stucco has a castle-like stone turret, French balconies, and shuttered windows. Château du Sureau has ten rooms and a private villa on its grounds. Each room in the château is named for a plant that grows on the property. Guests can choose to pay a room rate for a simple overnight stay, or they can select Full Board, which includes an overnight stay, lunch upon arrival, dinner for two, and a classic European breakfast in the morning. The Thyme Room is wheelchair-accessible and has a layout and bathroom designed for guests with mobility issues. Decorated in olive green and coral, The Thyme Room overlooks the courtyard and the terrace, which can be glimpsed out of its arched windows. A writing desk and a wood-burning fireplace complete this elegant room. The Rosehip Room is decorated in antique rose and gold and looks out upon the back garden and the nature park. The room sports Empire furnishings, a queen bed, and a cozy reading nook. There is a soaking tub in the bathroom to complete the comfort that this room offers. The Sweet Geranium Room is full of shades of terracotta, sand, and melon green. In it are a king-sized canopy bed, a snug sitting area, a wood-burning fireplace, and a balcony, which surveys the front garden, the pool, and the Sierra Nevada Mountains. The Mint Room is arrayed in tones of mint green and currant red. With a balcony view of the back gardens and the nature park, this room has a draped king-sized canopy bed, a wood-burning fireplace, and a Jacuzzi and separate shower in the bathroom. The Ciboulette Room is bedecked in forest green, cream, and rose. Its windows look out upon the back gardens and pathways. 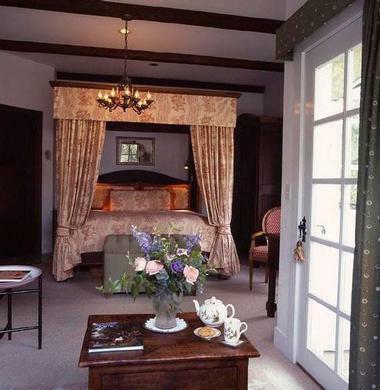 This room has two double beds, French country décor, and a shower. The Elderberry Room is wreathed in shades of blue, white, and honey yellow. The French balcony of this room looks out to the Sierra Nevada Mountains. Cathedral ceilings and whitewashed beams add to the magnificence of this suite, as does a stunning king-sized canopy bed and a wood-burning fireplace. The bathroom has a shower and a separate soaking tub. The Saffron Room is decorated in burnt orange, black, and gold. This resplendent suite boasts an antique ebony wood bedroom set and a black marble wood-burning stove. The bathroom has a shower and a black marble soaking tub. The Rosemary Room is ornamented in sky blue and emerald green. Its view is of the back garden and the Sierra Nevada Mountains. The king-sized canopy has lush draperies, and the room is made warmer by the comfortable sitting area and its wood-burning stove. The bathroom has a shower and a separate soaking tub. The Chamomile Room is bedecked in gold and celery green. 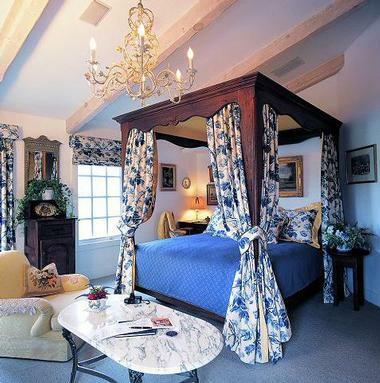 It is made truly luxurious by its cathedral ceilings, its king-sized canopy bed, and its elegant mahogany furnishings. The French balcony overlooks the back gardens and the Sierra Nevada Mountains. The Lavender Room is beautifully adorned in periwinkle blue and lavender. It has a lovely king-sized sleigh bed, and a small balcony overlooking the front gardens, the pool, and the Sierra Nevadas, and it contains a sitting area and a wood-burning stove. The Villa Sureau is a private gated property on the grounds of the Château du Sureau. Surrounded by an oak and pine forest, this secluded estate house boasts 14-foot ceilings, two exquisitely furnished bedrooms, two marble bathrooms with oversized whirlpool baths, and a library and drawing room. Throughout this private domain are antiques, works of art, and tapestries, all of which date from the 19th century. Guests of the house can also enjoy a personal outdoor spa. The restaurant came first. Once upon a time, Erna’s Elderberry House Restaurant stood alone, until frequent enquiries about local places to stay inspired Erna to build her own hotel. The restaurant has been awarded and praised throughout the restaurant industry for its fine French cuisine and its imaginative menus. It contains three separate dining areas, all of which are adorned with French provincial antiques, tapestries, and oil paintings, and its outdoor terrace looks out onto a superb view of the Sierra Nevada Mountains. 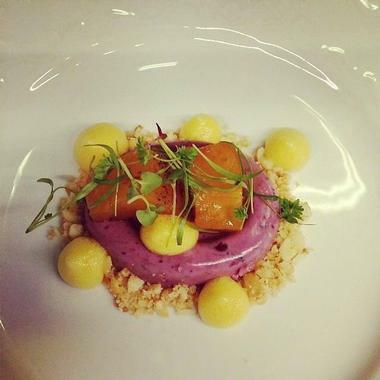 All food served in the restaurant is locally and ethically sourced, and vegetarian options are available. The restaurant is open for lunch and dinner and offers a tasting menu, a three-course meal, a la carte dishes, and Sunday brunch. The Bistro Bar serves drinks and hors d’oeuvres, and has an extensive wine list. Many of the wines on the bar’s list are from Austria, Erna’s homeland, but there are a rich variety of California wines as well. Those inspired by the tempting menus at Erna’s Elderberry House Restaurant may wish to enroll in a half-day cooking class or a three-day cooking course held twice annually. The Spa du Sureau has an extensive list of services. Massages are very popular, and there are many types to choose from. Guests may like a traditional Swedish massage, or a Deep Tissue Massage to untangle deep muscle pain. Hot Stone Massages use basalt stones with peppermint and grapeseed oil to console your aching body and ease your tired mind. The Thai That Sa-Wan massage is performed with a muslin bag of fragrant herbs and spices. It opens up the pores, relieves stress, and re-energizes the body. Pre-natal massages and couples massages are also available. The Spa du Sureau offers truly original body treatments, and it is particularly known for its Hydrostorm therapy. This body treatment is the ultimate water ritual. Beginning with custom-blended salts or seaweed, which are spread over the body, guests enter a room in which light therapy lamps blend with cascading showers, raindrop therapy, and alternating cold and hot sprays of water. Many body wraps are available. Marine Body Masques use algae, seaweed, and rosemary to tone and firm the skin, while Silk Slumber Wraps use Shea butter to exfoliate and stimulate the skin. Lavender Blossom Body Wraps polish and de-stress the mind and body. Facials for every skin type and need are offered by the spa. There are facials for firming, toning, re-hydrating, detoxifying, cleansing, and nourishing the skin. The spa also offers herbal baths, seaweed baths, and mud baths. Also on offer are reflexology, treatments for men, and hair and makeup artistry. Château du Sureau can help create the perfect wedding day. Couples can choose a highly intimate affair in the House Chapel, which holds six guests, a comfortable 50-guest wedding in the beautiful Grand Salon, or a 100-guest wedding in the Gazebo next to the Koi pond. Everywhere there is beautiful scenery, delicious food, and a wedding consultant to help plan all the little details of the day. Honeymoon packages are also available, and include a two-night stay, dinner for two, picnic lunches, two couples’ massages, and a herbal bath right in the comfort of the guest’s own room. More vacation ideas: 45 Best Weekend Getaways from San Francisco.